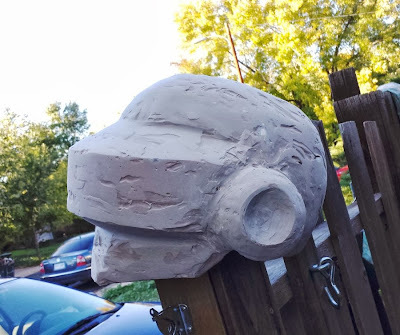 At the end of my last post, both Daft Punk helmets had been formed with papercraft and fully reinforced with fiberglass. 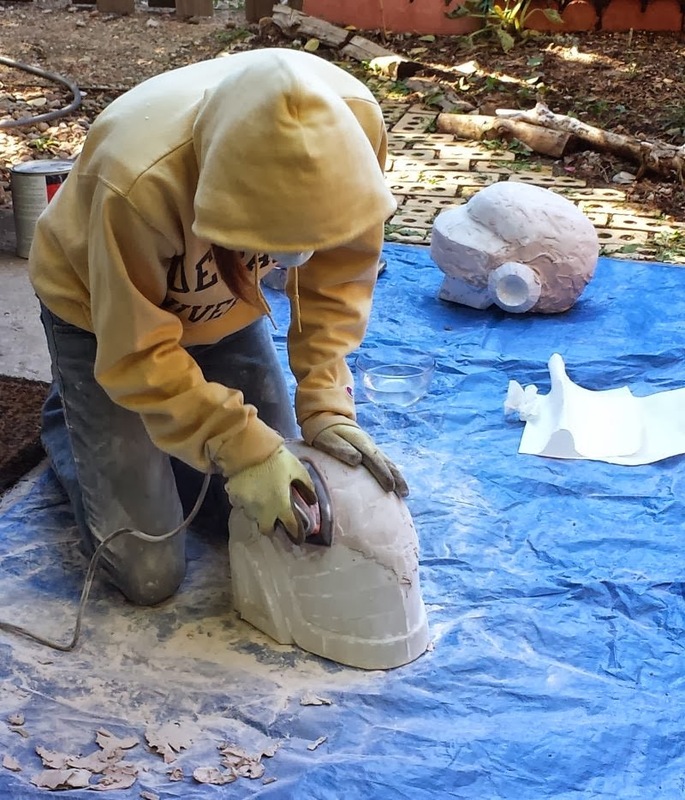 Once the fiberglass had cured, the helmets were rock hard, but fairly lumpy on the outside. The fiberglass cloth was applied to the inside, leaving the hard edges and seams of the original papercraft on the outside. To smooth out these bumps and produce a nice surface for painting, I used Bondo. 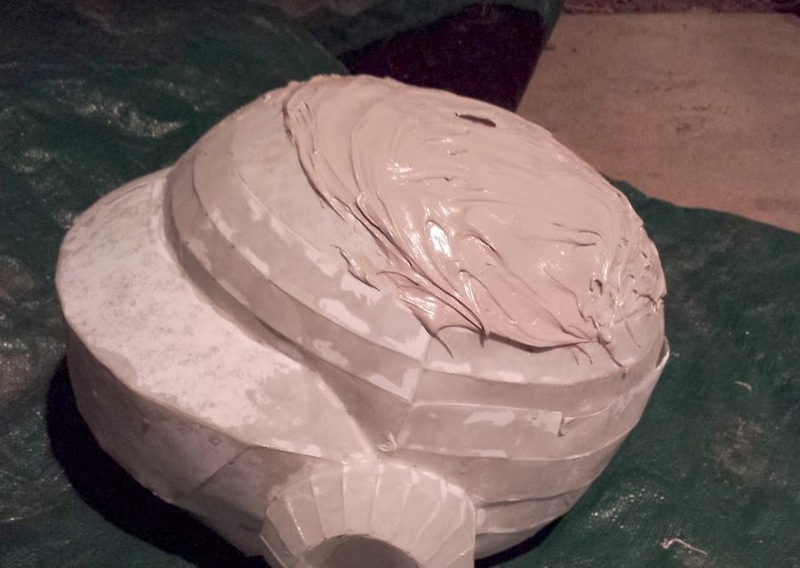 Bondo is a putty-like substance that starts as a two-part mixture, goes through exothermic curing once mixed, and ends up as a hard clay-like substance. The final state is relatively easy to sand, allowing for fine tuning of the surface shape. 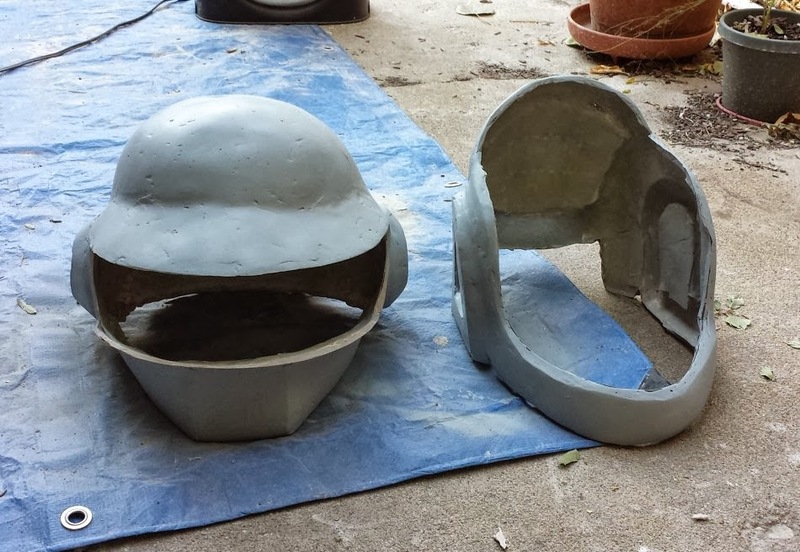 The idea here is to iteratively shape each helmet by applying Bondo, letting it cure, then sanding it down. With each iteration of this, the helmets get closer to their final shape. It's a lot like icing a toxic cake. With some 60 grit sandpaper, I was able to shave off a lot of the goopy unevenness of the first layer of Bondo. My goal was to sand it down to the correct shape, and if I hit fiberglass, add some more Bondo everywhere to allow for more even sanding. 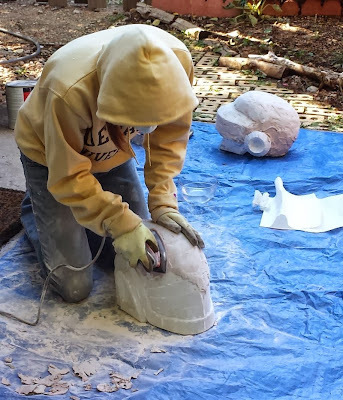 I enlisted some help for sanding, since doing two helmets lends itself easily to two people working. Helper with tiny power sander was a life saver. Not quite what I had in mind.. The biggest issue we ran into was air pockets. I was not at all careful with my first layer of Bondo, so as we sanded it down we found many dents and pockets caused by uneven application of Bondo. 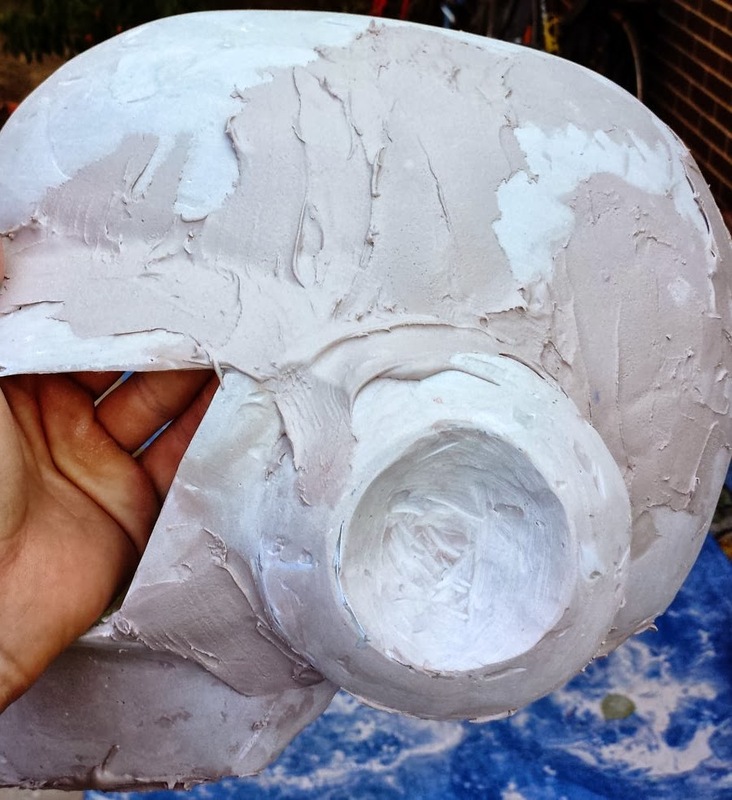 At first we tried filling these holes with more Bondo, applied with a small stick for precision. This took a long time and was not nearly as precise as I wanted. In some areas we also needed to add an even layer to get away from the fiberglass beneath, but would end up with even more pockets and dents using Bondo. Fixing past mistakes and adding future ones. You'll notice in the pictures that the visors have been cut out already. In order to create the clear plastic visors later on, all we need is a solid block that mimics the desired shape. Since the mold doesn't need to be perfectly smooth, I went ahead and cut them out using a Dremel rotary tool. The key was using the right cutting bit and being very careful. I ended up breaking two different cutting bits in during the process, so I won't claim I know which one is best to use. To get the rest of the helmets smooth faster, I tried a two-part solution. I bought some liquid nails that claimed it was easy to sand once cured and used a small nozzle applicator to fill in dents and holes. Unfortunately, each application was taking days to fully cure, and I didn't have that much time to waste. The next part of the solution was to use filler primer spray paint. This is a type of primer that has a decent amount of volume to it when applied, so it helps fill in small dents and holes. Once the helmets had all of the major bumps smoothed out, I switched to primer. The difference in surface area was surprising. To eliminate dents, we followed a simple pattern: apply two coats of primer, let dry, sand with 220 grit until Bondo shows, wash, let dry, repeat. After three or four iterations of this, most of the dents had disappeared. 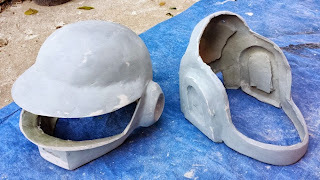 During this process I also cut out the mouth slit on the helmet that needed it, since the hole left by papercraft had been accidentally filled in during the Bondo process. Again I used my Dremel and switched between a few bits while cutting. This whole shaping ordeal took a long time and a lot of effort. 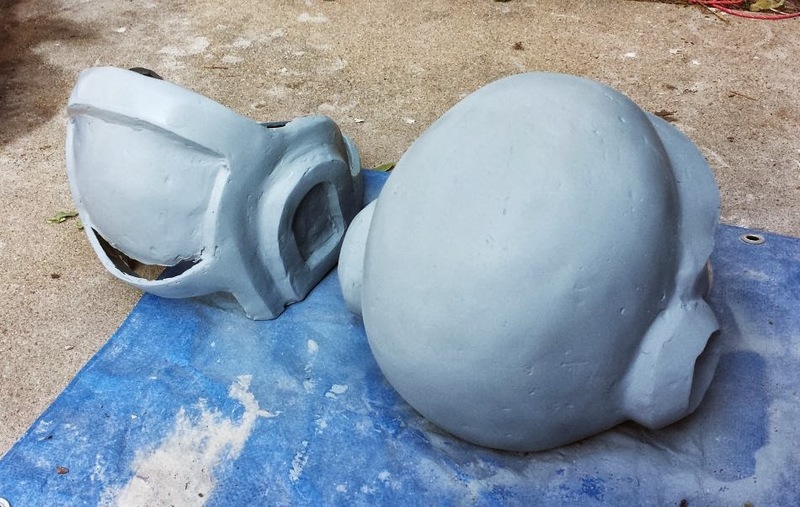 Most of the helmets are large smooth surfaces, so hand sanding wasn't too hard. For the smaller details around the ears, I used a Dremel to carefully sand them down while maintaining the angles I wanted. While the final shape was not 100% perfect, it was good enough for a costume. At this point, both helmets were ready for real paint. In one of my next posts I'll cover what steps we go through to get the nice reflective silver and gold surfaces needed. Spoiler: there is lot's of sanding involved.